Taking place on 2 and 3 July and the first of its kind, Community Business Weekend will see community businesses all over England throw open their doors and host inspiring events to promote the positive impact they have in their local area. Community businesses are owned and run by the community with the aim of helping to bring people together to improve their local area, boost the local economy and quality of life of local residents. The organisations taking part in Community Business Weekend are varied and span the country. Participants holding events include a grassroots football association in East Lancashire running coaching sessions; The Bevy community pub in Brighton is hosting a family fun day; a railway preservation society is holding a community heritage event in South Tynedale, Derbyshire; Granby Four Streets regeneration project in Liverpool is hosting its community market and Fordhall Farm in Shropshire, one of the most high profile community businesses in recent years is holding an open day inviting people behind the scenes. The campaign is driven by Power to Change, the charitable trust set up by Big Lottery Fund to support community business in England and is also supported by Plunkett Foundation, one of the leading community business support providers. Marie Staunton, Interim CEO of Power to Change, said: “Whether you voted to remain in or to leave the EU, we are all facing the challenge of divided communities. Now more than ever, it is important to celebrate community businesses that bring local people together to build stronger, more inclusive communities. Often set up in the face of adversity, community businesses give an opportunity for local people to improve their place by owning a business that trades for the benefit of their local area. They help people reconnect with their neighbours and provide services that the community really needs. This year also marks the 10th anniversary of Fordhall Farm, a landmark community initiative which made headlines around the world and is one of the key supporters of Community Business Weekend. Britain’s first community-owned farm was established after a David and Goliath-style battle by a brother-and-sister team to raise £800,000 to buy the tenancy. Charlotte and Ben Hollins launched a campaign to save their late father’s legacy at Fordhall Farm in Shropshire. Now 10 years on they are so grateful to the thousands of shareholders and volunteers who supported their cause. They are key supporters of the drive to grow community businesses across the UK. The farm, which has proved a massive success story with a new farm shop and cafe added to the facilities during the last decade, will be open for the July weekend. Another community business taking part is Burton Street Foundation in Hillsborough. 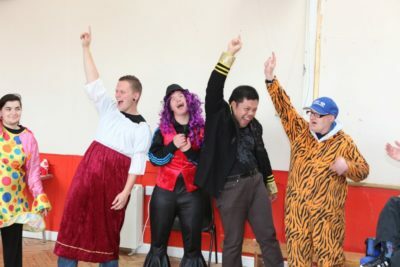 It provides a range of activities for the local community from what used to be an abandoned school, including sessions specifically for adults and children with learning difficulties. During Community Business Weekend, Burton Street will give visitors guided tours, run a host of activities for people of all ages including those with disabilities, share information on their services and hold a local history exhibition. Fordhall Farm and Burton Street Foundation are available for interview and images are available.